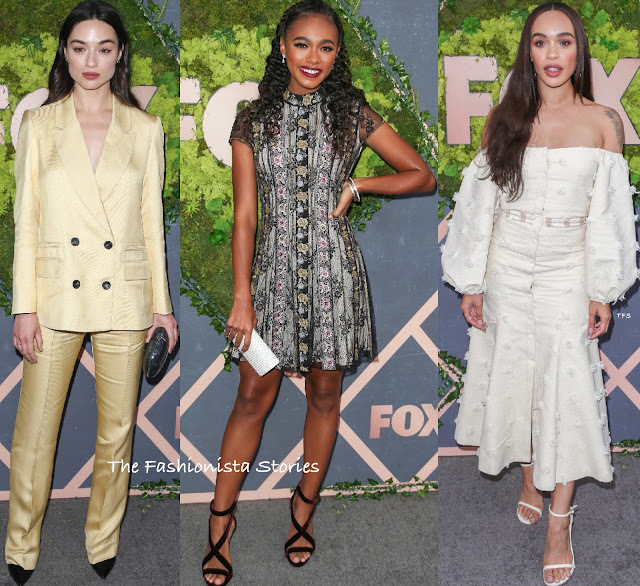 Jordana Brewster and more attended the 2017 FOX Fall Party on yesterday evening(September 25th) at Catch LA in West Hollywood, CA. January Jones wore a THE VAMPIRE'S WIFE black & purple floral metallic, ruffle mini dress styled with black multi-strap pumps. If this dress looks familiar, that's because we saw it on Ruth Negga in a longer version. Amber Stevens West wore a PAULE KA layered ruffle dress which stopped above her knees. My only quibble is that I wish she wore her hair off-the-shoulder. Gold accessories finished up her look. Halston Sage worked the split on her ALEXANDER WANG red silk, v-neck dress with a twist detail waist. Center part waves and black ankle strap sandals finished up her look. Crystal Reed took on the power suit look courtesy of TOPSHOP. Her cream colored double breasted suit was teamed with a JEFFEREY LEVINSON clutch and PAUL ANDREW pumps. The pants needed to be hemmed but she does look great. Chandler Kinney wore a ALICE + OLIVIA FALL 2017 multi floral embroidered mini dress which featured contrasting sheer lace panels and a mock neckline. A white clutch and black strappy sandals, a dark red lip and a braided curls finished up her look. Cleopatra Coleman wore a cute MARKARIAN off-the-shoulder calf length dress with fringe detail, a center front button closure and long puffy sleeves. Center part tresses, smokey eyes and white ankle strap sandals finished up her look.